Big Man's Cycling Jersey - Stays Dry, Very Breathable. 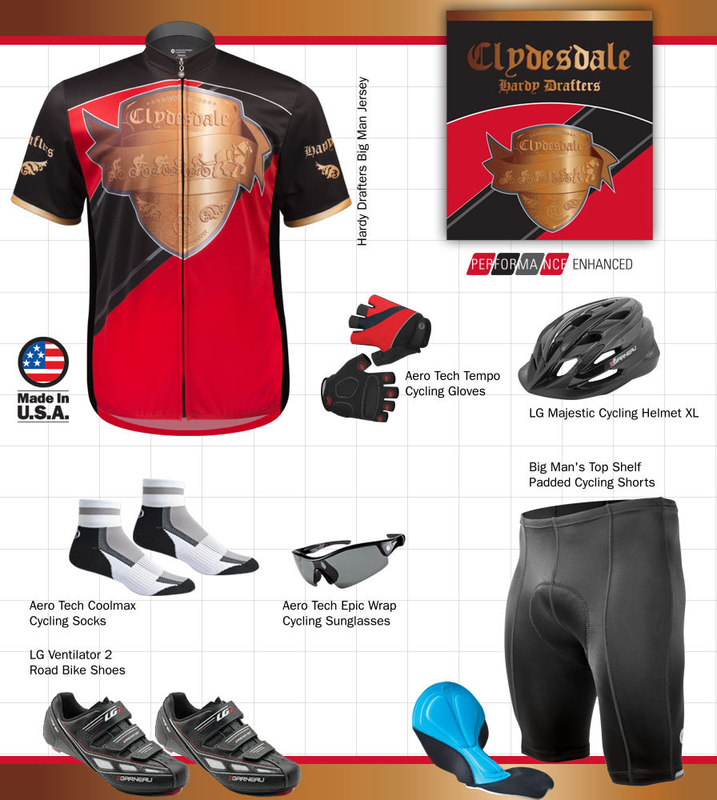 The Clydesdale horse inspired this beautifully designed, plus size cycling jersey. We were inspired by the use of a Clydesdale in an Amish farm in rural Indiana. The strength demonstrated by this big draft horse is truly amazing as a working breed. You can see them working in the organic farm fields of the Amish people. The Clydesdale horse, came from the farms in Clydesdale, Scotland. The Clydesdale is an immensely strong, barrel-chested horse. It was originally bred for hauling and doing farm work and is still used for these purposes today. The Hardy Drafter cycling jersey tries to capture the strength and essence of strength and stamina within the Clydesdale horse. The Clydesdale term is used to describe "big" athletes, and now there are competitive divisions in big races which categorize people based on weight minimums outlined in the USA Triathlon Competitive Rules. Athletes competing in the Clydesdale division must be a minimum of 220 pounds and athletes in the Athena division must be a minimum of 165 pounds. Clydesdale & Athena National Championships. Reflective Tab below the 3 easy to reach back pockets. Loved the jersey, I had it shipped 2 day so I could have it for the twin cities tour de cure. It rained and was cool for most of the 100 mile ride. 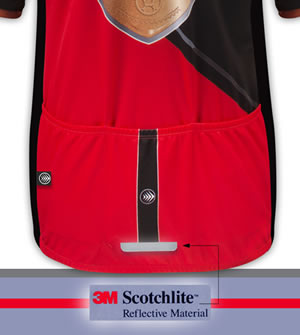 But the Jersey was perfect as far as fit and comfort level. Very attractive jersey good quality sublimation printing. Slightly on the smaller size than I expected. Zip quality questionable time will answer that quandary . I'm a big guy. Club cut so it fits. A lot of fun comments with this shirt. Remember we excel at downhill! I like the fact it's cut for a bigger guy. At 6'4 285 lbs, I am a Clydesdale and always have trouble finding jerseys that are snug but not an 8th layer of skin. This one fits well and is long enough which is a double bonus. Shipping was very fast especially considering I needed to exchange the original size I got. ...the guy was passing me on the trail, saw my jersey, and laughed so hard he almost swerved off the trail. Mission accomplished. I'm on the smaller end of the 3XL, and it's a nice club fit style jersey for me. Back pockets fit my cell phone, snacks and gloves easily. Someone else mentioned the zipper issues, and I've had a split happen once. It was simple to fix on the trail, but take some caution on zipping it up before you go. Very comfortable. I wear a wicking under shirt with it to stay dry. The quality and fit (ordered XXL) was excellent. The colors are vibrant and the Clydesdale design is awesome. Quality jersey and XXL fit perfectly. Colors are vibrant and Clydesdale design was great. Best part was made in USA. Great Gear for the large frame. Love this jersey the sizing was true to the chart, the quality of the product is exceptional. I will buy all of my kits from Aerodesigns. This company understands that not all cyclists are built the same. Thank you. The jersey looks and feels good and fits well. What more could you ask for? It's a really neat design and very comfortable. There's plenty of breathing room for bigger guys and the elastic around the bottom gives a "custom" fit without being too tight. My husband loves this shirt. It fits him perfectly. Great cycling jersey for us bigger guys. Road in a recent Fondo and got a lot of complements. Thanks for a great cycling jersey! The elitist world of cycling favors those of small stature who can easily fit into a bicycle jersey the size of a cocktail napkin. Well, there are plenty of us folks who don't fit that mold who enjoy riding our bikes and we need gear just as much. Big shout out to Aero Tech who noticed this and has now started to make more jerseys in bigger mans' sizes. This jersey is very stylish, fits well, and allows those of us of a larger stature to wear bicycling gear just like the little people. Now if I could find some folks that would like to go out and ride and not make a competition of out everything, I would be a very happy camper.